Soon after I clicked the button to publish last week’s update on the status of the sale of Catholic Health Initiative’s assets in Louisville, I was told by an anonymous reader that a group of capital investors was the last of potential buyers still in the game. Perhaps naively I have been assuming that only other hospital systems would be interested in acquiring the clinical operations of Catholic Health Initiatives (CHI)/ KentuckyOne Health in Louisville. I was aware that at least parts of one of the doctors office buildings next to downtown Jewish Hospital had been transferred to a new landlord. A quick look at the Jefferson County Property Valuation Administrator’s (PVA) website and a bit of Internet research revealed much more. Beginning in 2015 and finishing in the spring of 2016, CHI sold all of its local medical office buildings and outpatient medical centers (of which I am aware) to a single, investor-owned, national real-estate investment trust (REIT) – Physicians Realty Trust and Physicians Realty L. P. (Nasdaq- DOC). I must be the last person in Louisville who knew the extent of these real-estate sales. This third-party owner is now necessarily a major player in planning the future of not only the downtown medical Center, but the healthcare infrastructure of the Jefferson County region. The rents must flow! The PVA names the owners of several properties or condominiums at 201 Abraham Flexner Way as ” DOC 225 Abraham Flexner Way MOB LLC.” This is a Kentucky affiliate of a Wisconsin company which is itself a subsidiary of Physicians Realty Trust. [I stand willing to correct the nomenclature of the connections between this network of corporate connections and agents!] It is clear however, that Physicians Realty Trust is at the top of the organization chart. In its Security and Exchange filing for the period ending December 31, 2016, the company details its acquisition of 95 operating healthcare properties, 49 of which were acquired from CHI in May and June. Of the CHI properties, 11 were in Kentucky – 7 of these in Louisville or Shepherdsville. The Premier Surgery Center of Louisville was acquired earlier by Physicians Realty Trust in April 2015. (Ownership of the adjacent Jewish Hospital Medical Center Northeast facility has remained with its original local developer (Old Henry Healthcare 1 LLC ), and it is managed by NTS. The CHI properties are an important book of business for Physicians Realty Trust. KentuckyOne Health alone is its largest tenant both in space and rent with an expectation of annual rents of $12.8 million that comprise 5.8% of the company’s gross rent portfolio. The next three largest tenants in terms of rent are also units of CHI. Only the state of Texas would have spun off more annualized rent income than Kentucky in 2016. The total annualized base rent from CHI-affiliated tenants makes up 17.4% of Physicians Realty Trust’s book of business. It is clear that what happens here in Kentucky can have a material effect on its own business. I cannot imagine that the company is not fully engaged in the negotiations over what happens to KentuckyOne. Better than I can, the company’s own language in its SEC filing outlines the risk to itself, or for that matter any entity that would buy the real-estate assets or healthcare operations of KentuckyOne in Louisville. Is this really gonna to hurt? The fact that the land under Jewish Hospital is owned by the Commonwealth brings yet another major player into the room. 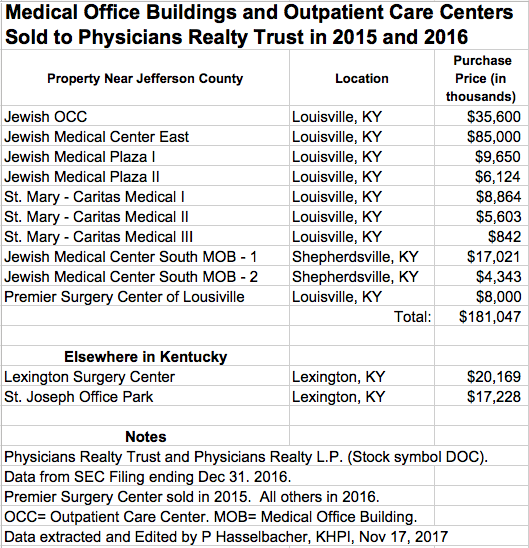 In fact, looking at the catalog of Physicians Realty Trust’s properties, it appears that it owns the land under only one of the Louisville properties it acquired from CHI! I do not know who the other landowners are. Land and buildings represent only one facet of the assets of KentuckyOne Health to be disposed of. There must be several hundred medical practices, employed physicians, or other business entities that are tenants in these buildings or are mutually interdependent with the many business activities of Jewish and Sts Mary and Elizabeth Hospitals. It seems to me that issues related to the departure of CHI/KentuckyOne from Louisville are going from complicated and difficult, to byzantine and herculean. When I learned that CHI was extending the date six months to June 30, 2018 to complete its planned Louisville sale, my first thought was that it could not find a buyer. That may still be true. It occurs to me that even if all the planets are aligned, that it may take that long or longer to wade through all the contracts and contingencies involved in such a broad and tangled transaction. I wish I were more confident that an orderly withdrawal by CHI/KentuckyOne from its business activities in Louisville with manageable collateral damage to our healthcare infrastructure or its people is actually possible. The pessimist in me says it is not. The optimist in me says “What do I know about business negotiations? Trust the players. Everything will be ok.” The realist in me says we will not know until it is long over, but that not everyone will be a winner. With apologies for my (mis)appropriation of favorite phrases from the movies “Dune” and “Hannibal,” and as always, if I have any of my facts wrong, help me correct them. Previous Previous post: The Search For A New President of UofL Must Be More Open. Next Next post: City Air Makes You Free. A Public Health Case for Sanctuary Cities.